Hospital acquired infections (HAI) are the number four cause of death in the United States at an annual cost estimated at $40 billion. With emerging scientific data regarding the contribution of air contamination to surgical site infections (SSI), there is increased interest in considering innovative adjunctive technologies to support best air quality in operating rooms (ORs).The study was designed to test the effectiveness of the novel AEROBIOTIX (ABX) crystalline ultraviolet (C-UVC) germicidal irradiation inroom air disinfection and filtration technology on reducing airborne particle contamination in the OR. Single-pass laboratory-based tests were performed to evaluate inactivation efficiency of ABX C-UVC reaction chamber on aerosolized bacteria, viruses and spores. Clinical field tests were carried out to assess the efficacy of C-UVC air recirculation/filtration device on reduction of airborne colony forming units (CFU) and viable particle counts (VPC) in the OR. 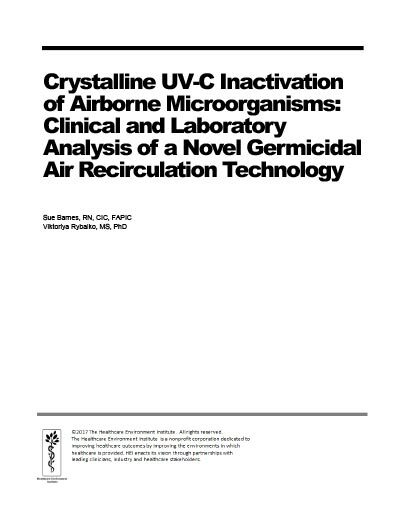 The ABX C-UVC system was developed to maximize UV-C dosage required for full inactivation of airborne pathogens while maintaining a high air flow volume of 450 CFM. Laboratory-based in-duct tests were carried out to measure microorganism survival rate after a single-pass exposure to the device CUVC reaction chamber (Figure 2A/B). The calculation of the test organism survival rate was based on the ratio of the downstream to upstream organism counts. All sampled were collected for 10 seconds upstream and 1 minute downstream (n=6 for each location per microorganism tested). Results showed over 99.9% inactivation efficiency of B.atrophaeus, S. epidermidis and MS2 virus test microorganisms during a single-pass test (Figure 2C) confirming highly biocidal property of C-UVC chamber design. To evaluate the effectiveness of the C-UVC air recirculation device in the clinical operating room setting ABX C-UVC units were installed in an active OR with standard positive-pressure ventilation. The supply room in sterile instrument processing area was designated as clean area and utilized as an environmental setting control for comparison purposes. Quantifications of viable airborne microorganisms were performed with C-UVC device in place. Samples were taken over the 4-hour period with device turned OFF (BASELINE) and ON (C-UVC). Two surrogate measures of microbial air contamination were used to evaluate air quality, the colony-forming units (CFU/m³) and viable particle counts (VPC/m³) respectively. During baseline condition in the OR (deviceoff; no C-UVC) the average bacterial counts were at 39 CFU/m³. 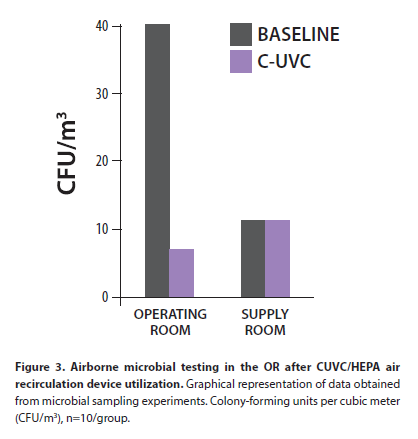 Deployment of the C-UVC device produced significant decrease in air microbial burden as evidenced by sharp reduction in airborne bacteria counts to 7 CFU/m³ (= 82% reduction) (Figure 3). As expected, no improvement in bacterial counts was seen in the sterile processing area supply room due to initially low bacterial levels detected during baseline period (11 CFU/m³).